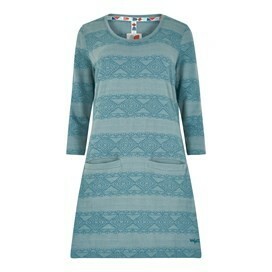 Wear the stylish and versatile Abree jacquard tunic this season, ideal for changeable days out and about. Made from 100% cotton and with a stunning jaquard pattern throughout, this tunic is bound to turn heads for all the right reasons. Not only does the Abree jersey tunic look great paired with shorts and sandals, but also with jeans and boots when it starts to get cooler and the temperature starts to drop - a year round wardrobe winner. Nice quality thick cotton. Good fit. But... Hem not quite caught into the stitching in 3 places. I've sewn this in myself.